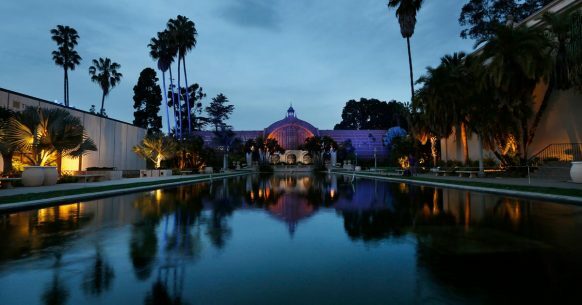 This month Balboa Park is filled with sights, bites and a few frights in honor of Halloween. From makers to music to pop culture to hair-raising art, there is so much to do in October it’s almost scary. For lovers of all things Italian, you won’t want to miss the 2018 Festivale, which features 13 films, including Sergio Leone’s 1968 masterpiece “Once Upon a Time in the West,” and the Oscar-nominated coming of age film “Call Me by Your Name.” Want to enjoy some Italian food along with its cinema? Check out the Festivale’s Gala on Oct. 7 prior to the screening of “La Vera Leggenda di Tony Vilar” (The True Legend of Tony Vilar), a musical mockumentary. Make the most of your weekend by exploring the wild, wonderful world that is Maker Faire. Described as part science fair and part county fair with a dash of gee-whiz technology, the Marker Faire is an all-ages gathering for crafters, engineers, artists, builders, tinkerers and enthusiasts. Ten different venues are participating, including the upcoming Comic-Con Museum, and the weekend-long event will also feature two outdoor zones, robots, drones, beer, food trucks, music, and, of course craft making. The event runs from 10:00 AM to 6:00 PM each day. The glass is more than half full at the fall art show featuring the work by local artists. More than 30 glass artists will display their creations on the patio of the Spanish Village Art Center and there will be live music and demonstrations of glass blowing and glass cutting as well as mosaic art projects for children and adults. The event runs from 10:00 AM to 5:00 PM each day. The WorldBeat looks to bring the common language of laughter to San Diego by establishing San Diego’s first World Comedy Jam. Modeled after other comedy events such as the Edinburgh Fringe Festival and the Melbourne Comedy Festival, this event is designed to produce not only laughs but understanding through multicultural comedy acts. The lineup features comedians from around the globe from such countries as the United Kingdom, Brazil and South Africa. Calling all lovers of Japanese pop culture. Get your anime, manga, video game fix in the upper level of the Japanese Friendship Garden. The party will include live performances, activities, a DJ and a costume contest. Food and alcohol will be available for purchase. The fun runs from 7:30 to 11:30 PM. San Diego’s Civic Organist Raúl Prieto Ramirez in partnership with the San Diego Opera for a night of arias from some of the world’s most popular librettos including Carmen, The Marriage of Figaro and Rigoletto. The concert, which starts at 7 p.m., is free to the public. Want your scare a bit more sophisticated? The San Diego Museum of Art has you covered with its Spooky ArtStop tour, which is in partnership with the San Diego Shakespeare Society. With the price of museum admission, you’ll get to see some of museum’s most ghoulish and ghastly pieces in its collection while enjoying spine-chilling performances of works by Shakespeare and Edgar Allan Poe. The tours meet in the rotunda at 6 p.m. and the event is in conjunction with the museum’s Art After Hours program. This entry was posted in San Diego Events and tagged balboa park, entertainment by Jennifer Davies. Bookmark the permalink.